There has been no time for porridge or anything else in my house lately. The meals I have cooked have been of necessity, simple and quick. So it was good when I visited the country recently and my parents cooked for me. 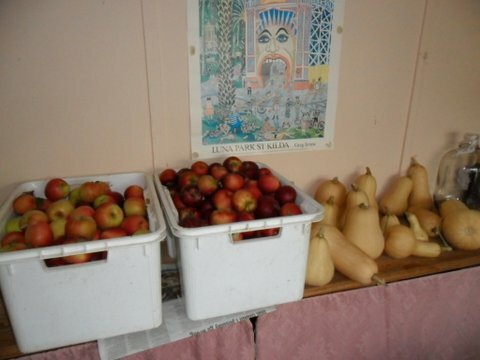 I was also able to admire my mother’s neat rows of broad beans, their butternut pumpkin supply and the olives that they have been curing in large plastic buckets in the back room. 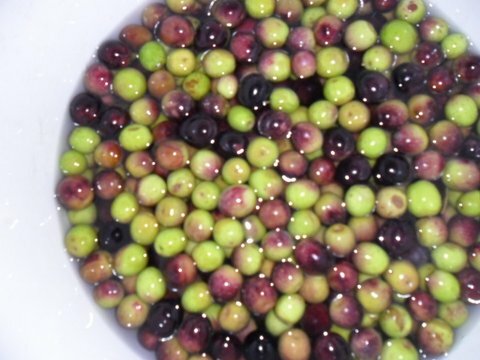 To cure the olives* they soak them in plain water for 40 days, changing the water every day. This helps to remove some of the bitterness. They then pour over a warm 8% salt solution and leave them, covered, for 2 days. The olives are then divided into jars and covered again with an 8% salt solution. To finish they are covered with an 2-3 mm film of olive oil and must be left for two weeks before eating. Mum and Dad keep the jars in the fridge but this may only be necessary after the jars have been opened. Of course you must use clean, sterile jars to begin with. The olives can be served marinated in olive oil and lemon juice with a bit of lemon rind, chilli flakes, garlic and herbs. * for this recipe you must use kalamata olives. For lunch we had lamb cooked on the barbecue. Dad had boned out a leg of lamb – he said this was relatively easy, the main requirement being a really sharp knife. You could get your butcher to do it for you if you don’t feel up to the challenge. Dad then made small slits in the meat and pushed in slivers of garlic. I recommend not using too much as you want the lamb to taste like lamb not garlic. The lamb was then marinated (for at least an hour) in the juice of 2 lemons, a good slurp of olive oil, chopped sage, thyme and a good few grinds of pepper and sea salt. 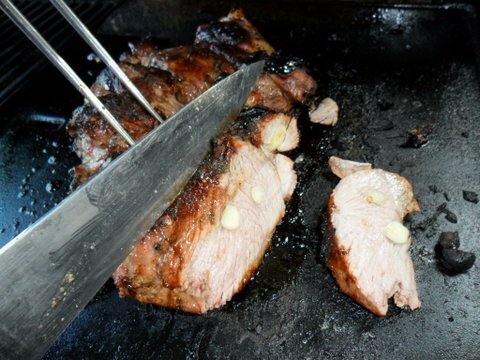 Dad then got the barbecue nice and hot and put the lamb on, skin side down. When seared on that side, he turned it over and did the other side – this took about 15 mins. He then turned the barbecue down and closed the lid, cooking the meat for about another 30-40 mins. He then turned the barbecue off and allowed the meat to rest for 15 mins. The result was beautiful, tender lamb.